It's as though every link in the chain of being is content. The hat-tipping farmer/pig is happy to represent a barbecuing concern. 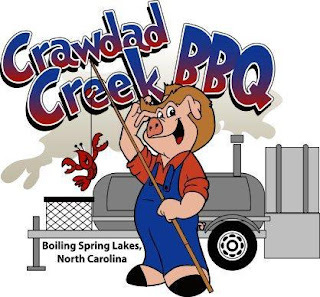 The crawdad is happy to have been fished from the creek and delivered into a land of deathly salvation. Back to our analysis: Regardless of its crustacean-boiling properties, Crawdad Creek and Boiling Springs Lake are surely magical places. They transform hogs—hogs who identify with their human overlords—into willing participants in the dark rite known as barbecue.